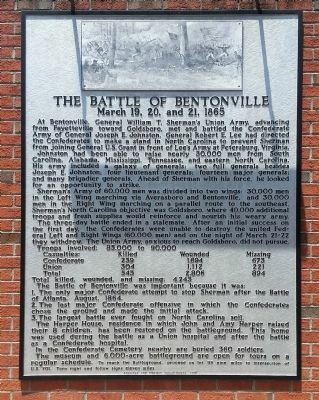 At Bentonville, General William T. Sherman's Union Army, advancing from Fayetteville towards Goldsboro, met and battled the Confederate Army of Generla Joseph E. Johnston. General Robert E. Lee had directed the Confederates to make a stand in North Carolina to prevent Sherman from joining General U.S. Grant in front of Lee's Army at Petersburg, Virginia. Johnston had been able to raise nearly 30,000 men from South Carolina, Alabama, Mississippi, Tennessee, and eastern North Carolina. His army included a galaxy of generals: two full generals besides Joseph E. Johnston; four lieutenant generals; fourteen major generals; and many brigadier generals. Ahead of Sherman with his force, he looked for an opportunity to strike. Sherman's Army of 60,000 men was divided into two wings: 30,000 men in the Left Wing marching via Averasboro and Bentonville, and 30,000 men in the Right Wing marching on a parallel route to the southeast. Sherman's North Carolina objective was Goldsboro, where 40,000 additional troops and fresh supplies would reinforce and nourish his weary army. success on the first day, the Confederates were unable to destroy the united Federal Left and Right Wings (60,000 men) and on the night of March 21-22 they withdrew. The Union Army, anxious to reach Goldsboro, did not pursue. 1. The only major Confederate attempt to stop Sherman after the Battle of Atlanta, August, 184. 2. The last major Confederate offensive in which the Confederates chose the ground and made the initial attack. 3. The largest battle ever fought on North Carolina soil. The Harper House, residence in which John and Amy Harper raised their 8 children, has been restored on the battleground. This home was used during the battle as a Union hospital and after the battle as a Confederate hospital. In the Confederate Cemetery nearby are buried 360 soldiers. The museum and 6,000-acre battleground are open for tours on a regular schedule. To reach the Battleground, proceed on Int. 95 nine miles to intersection of U.S. 701. Turn right and follow signs eleven miles. Location. 35° 32.294′ N, 78° 15.07′ W. Marker is in Selma, North Carolina, in Johnston County. Marker is on Interstate 95 2 miles south of Pittman Road, on the right when traveling south. Touch for map. Marker is at the Johnson County Rest Area. 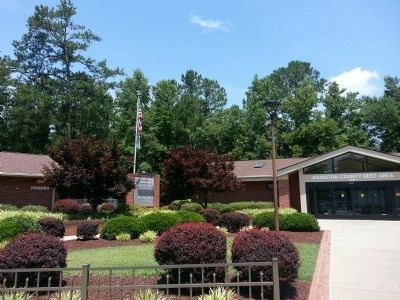 Marker is in this post office area: Selma NC 27576, United States of America. Touch for directions. Other nearby markers. At least 8 other markers are within 6 miles of this marker, measured as the crow flies. Mitchener Station (approx. 2.9 miles away); The Last Grand Review (approx. 2.9 miles away); Sherman Receives News of Lee's Surrender in Smithfield (approx. 5.7 miles away); Occupation of Smithfield (approx. 5.7 miles away); Edward W. Pou (approx. 5.8 miles away); The Town of Smithfield (approx. 5.8 miles away); a different marker also named Town of Smithfield (approx. 5.8 miles away); Hastings House (approx. 5.9 miles away). Touch for a list and map of all markers in Selma. More. Search the internet for The Battle of Bentonville. Credits. This page was last revised on June 16, 2016. This page originally submitted on June 26, 2014, by Bernard Fisher of Mechanicsville, Virginia. This page has been viewed 494 times since then and 13 times this year. Photos: 1, 2. submitted on June 26, 2014, by Bernard Fisher of Mechanicsville, Virginia.